≪Cereus with hairy flowers≫, because the calyx of the flowers has fine hairs. A genus of cereiform plants, mostly solitary, rarely branching, if so, from the base, exceeding no more than 4 m high, having very early long setose hairs at the base, ribs finely tuberculate, bearing a slightly sunken cephalium when adult, (Espostoci species have a cephalium deeply sunken in a groove), with long hairs and bristles. Areoles woolly, spines usually finely aciculate. Flowers nocturnal, self-sterile, appearing often in groups along and at the top of stems in the cephalium, white, pollinated by bats, but probably also by moths, also curiously purple in T. senilis, probably pollinated this time; by hummingbirds. Fruits hairy, with a plurilongitudinal dehiscence. Seeds variable, helmet-shaped such as in Frailea (T. blossfeldiorum), or small and black (T. senilis). Dispersal by ants (myrmecochory). 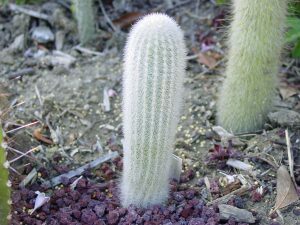 The genus Thrixanthocereus is endemic to Peru and grows mainly in valleys of the rio Maranon, in mountain forests, dry or humid, surrounded by an abundant vegetation (7. blossfeldiorum), but also in a spiny and dry matorral and on steep slopes (T. senilis), always in extremely rocky soils, from 400 m up to 2670 m in altitude. Peru (Amazonas, Ancash, Cajamarca, La Libertad, Piura).